"The search for the new leader of the Penn State football program is progressing very well. We are on schedule and I anticipate having the new head coach in place in a matter of days. The search is robust as we anticipated it would be and we have an excellent pool of candidates. I have heard from many coaches, or their representatives, who have expressed their interest in the position." Late last week, Miami head coach Al Golden was the man of the hour. Now on Tuesday it's Vanderbilt head coach James Franklin with a side of former Titans' head coach Mike Munchak. After interviewing with Penn State over the weekend, Munchak will now travel to Detroit to interview with the Lions according to ESPN. Munchak is scheduled to interview Friday with Lions regarding, league sources told ESPN NFL Insider Ed Werder. But like most of the days following the departure of Bill O'Brien, news is never lacking as CBS Sports reported Tuesday afternoon that Franklin has become a "clear frontrunner" to fill O'Brien's shoes. Franklin has yet to be offered the job, nor has any other candidate in Penn State's coaching search. Even so, Franklin is still one of the hottest names in college football making any news connecting him to Penn State a much discussed topic of conversation. Franklin was in Pasadena last night for the national championship game and will return to the East coast Tuesday evening. News broke on Tuesday that Vanderbilt assistant coaches had begun following Penn State's 2014 recruiting class on twitter, but that could be precautionary as much as any indication of Franklin's future plans. Vanderbilt coaches also followed several Louisville recruits now that Cardinal's head coach Charlie Strong has taken over at Texas. Vanderbilt's athletic director David Williams doesn't plan on losing Franklin. "I expect James to be our football coach. I'm planning on it," Williams said to CBS Sports. "We're looking at facilities. We're working on some stuff. I have all thoughts that he's going to be our football coach. I'll do everything I can to make sure that he is." So while the news on Tuesday is different than last week, the moral of the story remains the same. Fans will have to just wait and see what happens next. 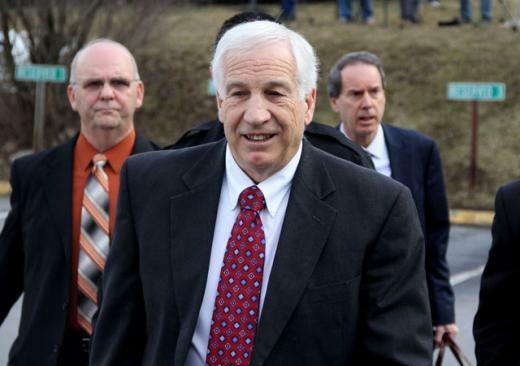 Former Penn State football coach Jerry Sandusky testified for more than two hours Tuesday morning during his pension forfeiture hearing in Harrisburg.